Here is a sample of the Native Gear we have Native Embroidery designs on. All Native Pride Clothing and Gear is produced with top quality material to ensure the highest quality available to you the customer. Eagle Feather, Bear Claw, Medicine Wheel, Sun and Zuni Sun. Our Football Jerseys are made with durable polyester material. 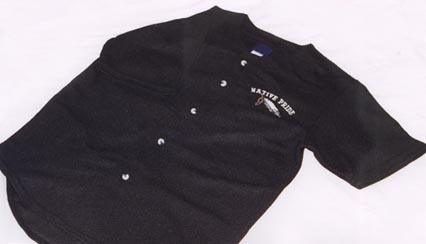 Embroidered on the front of the Jerseys is the "Eagle Feather" design and on the Back "Native Pride". Football Jerseys are available in black and gray only and are limited to our stock on hand, and will no longer be available when stock is out. Available in Large to 5XLarge sizes, for 2X and up add $2.00 per X.Sorry, we have SOLD OUT of this item. Our canvas web belts are made of cotton/wool blend (black) with a metal buckle. 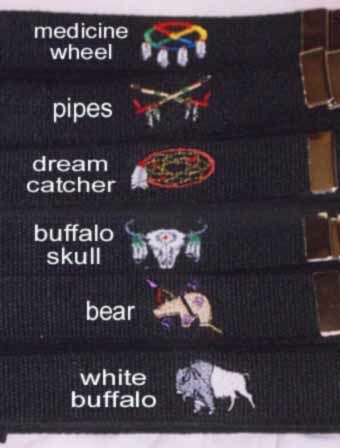 Belts are embroidered in the following designs: Buffalo Skull, Bear, Bear Claw, Concho, Dream Catcher, Eagle Feather, Last Buffalo, Medicine Wheel, NP-Native Pride, Pipes, Shield, Staff, Sun, White Buffalo, and Zuni Sun. Sweatbands are available in the following colors: black, charcoal, gray, red, maroon and white. 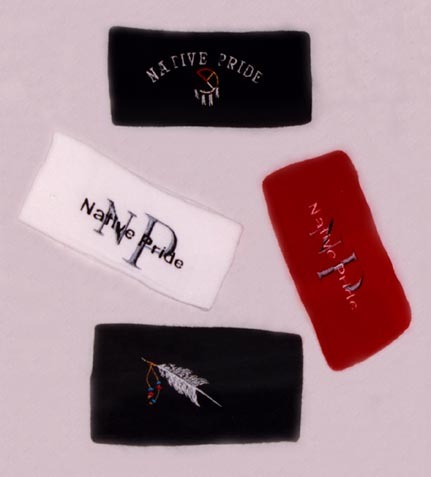 Sweatbands are available in the following designs: Eagle Feather, Medicine Wheel, NP-Native Pride. Sweatshorts are available in the following colors: black, blue, charcoal, gray, maroon, red, white. 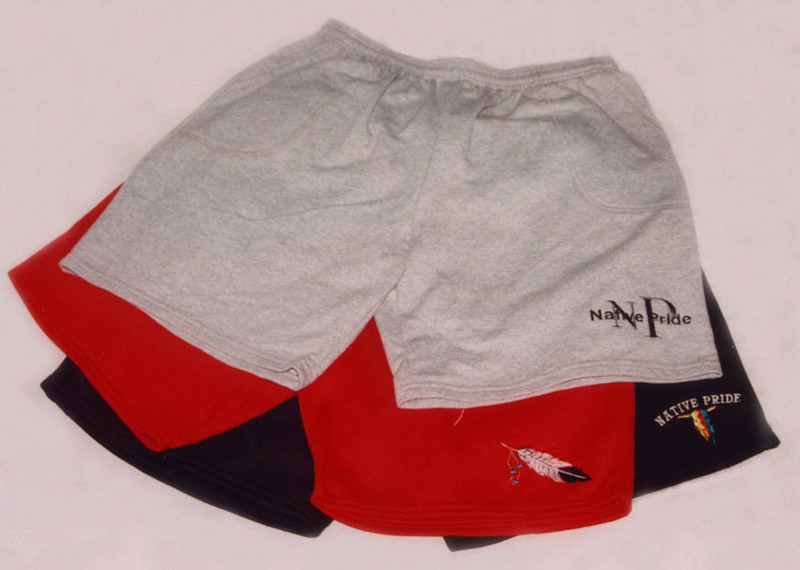 Our Sweatshorts are embroidered with the following designs: Buffalo Skull, Eagle Feather, NP-Native Pride.